New Yorkers are hard to impress. Traipsing from Brooklyn to the Upper East Side through winter’s first snowstorm last December, I was prepared for an underwhelming walk through the Met with just another food blogger. Look, an ice cream cone. Here, a sandwich. There, a spoon. But quite to the contrary, what I found on Angelis Nannos’ Yum Yum Met Culinary Art Tour was, well, very impressive. Long before he discovered his passion for the food world and for guiding tours, Nannos lived a very different life as a civil engineer. He left his hometown of Drama in northeastern Greece for the big city life in Athens. “I had my apartment, I had my car, from my balcony I could see the Acropolis. I had after-office drinks. From Friday evening to Sunday evening, I felt that I was alive. And from Monday to Friday I was really depressed. And then I hit a wall.” It was this wall that sent Nannos on a journey far away from his settled, 9-5 life in Athens, right before Greece’s government-debt crisis took hold in 2009. In Turkey, Nannos blogged about the local restaurant scene and lead Istanbul food tours. Nannos left Istanbul for New York right before Turkey’s 2014 political crisis took hold with full force. Nannos founded In Food We Trust in 2013 when he was still new to town. He fell in love with New York while visiting as a tourist, amazed on every trip by the food and culture he discovered in every corner of the city. “I already had a background in food guiding and culinary experiences because for five years I worked as a food guide in Istanbul, Turkey,” Nannos says. The research that followed was driven by his natural curiosity. 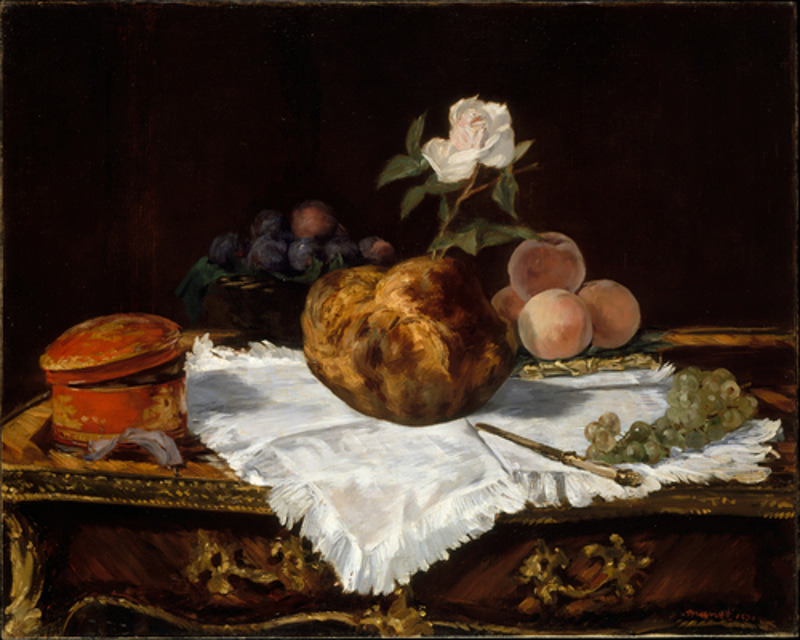 Unsatisfied with simply finding food in art at the Met, Nannos dug deeper into the way food in art lends insight into other aspects of life throughout human history. He started by taking his friends on exploratory tours through the museum’s food-related works to road test his findings. Although In Food We Trust now offers many food tours including an Upper East Side tour of the city’s iconic foods and a Greek food tour through Astoria, the Yum Yum Met Culinary Art Tour was the company’s first offering. “The Metropolitan Museum reminded me of something like a microcosm of New York City as a whole. In New York City, you see all these amazing monuments of architecture and art, and you can see the same thing inside the museum. Outside in the city you see all these multicultural communities, inside the museum you see all these treasures from all around the world at different periods of time. I saw from the very beginning a kind of parallel between New York City and the Metropolitan Museum,” Nannos says. On the Yum Yum Met tour, Nannos uses food as a sort of conversational diving board. We spent less time analyzing the art itself and the food depicted in it than we did investigating what food has represented to humans in any given civilization. 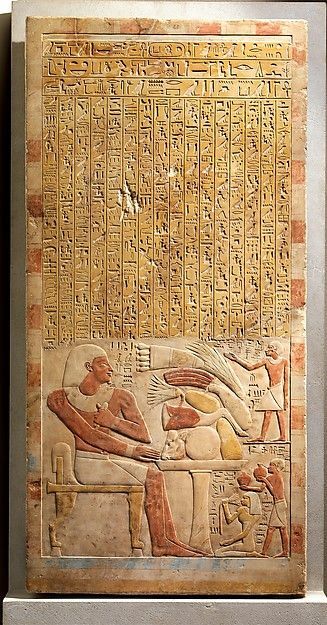 What meaning did food hold in the burial rituals of Ancient Egypt? What did Ancient Greek shopping lists look like? How did food impact early presidential races and the democratic process in the newly-formed United States of America? How did restaurants respond when women in America weren’t allowed to dine alone? What did dining out mean during the Great Depression? The Yum Yum Met tour begins with a menu. Nannos explains that he sees the Metropolitan Museum as a restaurant, and guests leave with a copy of the menu listing each artwork on the tour as a course of the meal. There are other thoughtful treats for guests to take home too, but we won’t spoil those here. Nannos incorporates technological elements in the tour too, including an augmented reality app called Zappar that powers a digital memory of the tour’s highlights for guests to appreciate and admire once they’ve left the museum. Call it a vestige of Nannos’ “geeky engineering past”. A full-price ticket for the Yum Yum Met tour costs $69, including the full-price entry fee that licensed tour guides and registered lecturers like Nannos pay directly to the museum. The tour itself is interactive and fun, and painstakingly well-crafted. Nannos has thought of everything, from perfectly-timed pit stops and rest breaks to questions that win guests charming prizes and art interpretation challenges that make you think. Whether you’re a tourist or a traveler or a jaded New Yorker like me, the Yum Yum Met tour will impress. You’ll leave with a whole new appreciation for the museum, if not for the city of New York and our rich food history. 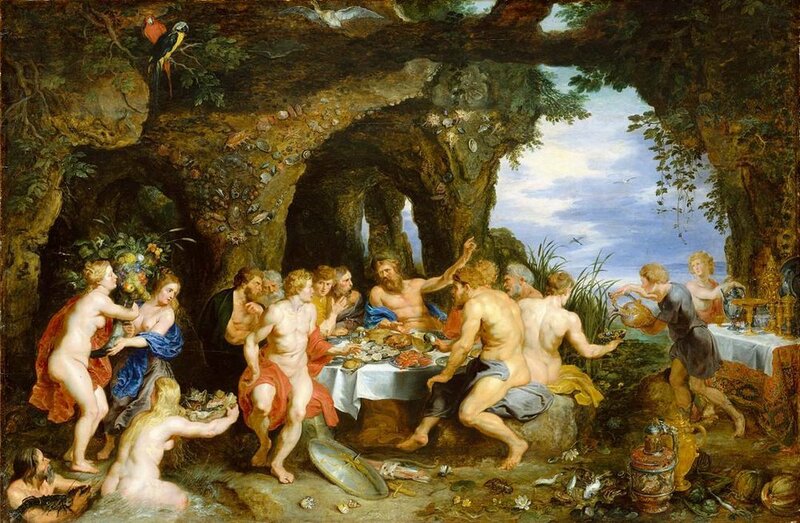 The Feast of Acheloüs; Peter Paul Rubens. Tables for Ladies; Edward Hopper. The Harvesters; Pieter Bruegel the Elder. Young Husband: First Marketing; Lilly Martin Spencer.